It has been quite a weekend here at the Writers Advance! Boot Camp Conference hosted at the Billy Graham Training Center in Asheville, NC. I was privileged to attend this writer's conference with several other aspiring authors from around the country. I have met fellow Christian writers from Ohio, Wisconsin, Illinois, and even as far away as Arkansas! I have been very blessed to have a roommate from Lumberton, NC, Mrs. Judy Taylor. She has been serving the Lord in Women's Ministry for over 16 years. She is seeking the Lord's guidance on compiling her collection of devotions into a devotional book. She has been a real blessing to me this weekend. I ask that you pray for her in her endeavors as she serves through Raft Swamp Baptist Church there in Lumberton. We have attended workshops covering everything from using Social Media to market yourself, to determining whether or not your story is worthy of making movie. There has been a wealth of information presented in a very small window of time. The highlight of this venture was that I was able to schedule several appointments with agents, traditionally published authors, and publishing company founders in hopes of pitching my books and obtaining critiques. I followed all of the necessary rules of submitting my books for a professional critique. I anxiously awaited the appointment with this author who has had over 50 Christian Romance books traditionally published. This lady really knows her stuff. I expected my work to be thoroughly shredded. The lady treated me with great respect and gave her advice in love, for which I was extremely thankful. I came back to the room after my critique interview to tweet my husband to call me. I needed to hear his voice. Through tears of disappointment, I recounted the events to him. Evidently, just because I have those out there who like my work, who happened to not be related to me or my BFF's, evidently doesn't mean that I'm a good writer. There are several things that I need to work on mechanics, plot development, and all sorts of things. I need a very good professional editor to work with on my pieces. Thankfully, I now have a host of resources at my disposal and I should be able to find one. However, was I thrilled to see all of the "red ink" on my papers? Not on your life! After the critique on my first book, I felt like pulling if off of the market and throwing it away! I was told that I might have a good little story going in my second book, but that one needed a whole lot of re-writing also. Needless to say, I came away thankful for an honest opinion, but disheartened at the same time. Although my husband's voice was indeed comforting, the Voice that I needed to hear came in His still small way. Will I pull book one from the cyber shelves? No. Will I rewrite it at a later date? No. Will I correct it to make it a better read? Yes-but not immediately. But, unless the Lord leads, I'll not be making any plot changes, even if that means that I'll never be traditionally published. I truly feel that the Lord inspires these stories because He has given me this gift-and I intend to give the stories that He sees fit, not what will sell thousands of copies. It's the message that He wants me to bring; even though I write it, I know He uses it to accomplish His work. I also met with an agent today. When I told this agent that I was self-published, that was the end of the discussion. I was informed that agents didn't pick up self-published authors, because publishers would immediately pull up their Amazon profile, see the lack of sales, and would assume that we indies weren't marketable. Again, another closed door. I am thankful for the knowledge that I've gained through this experience. 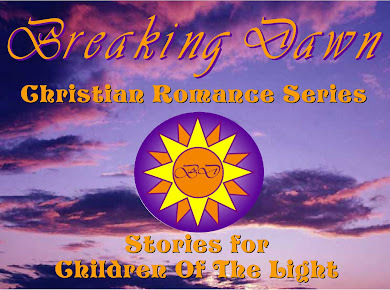 I will take it to heart, and apply the knowledge to my current work in progress, Book Three of the Breaking Dawn Book Series, Coming Home. I am resolved to keep writing as long as the Lord allows me to. I'm sure there will probably be many more tears on my pillow, but they will dry-and the pen goes on. Success is not in numbers, but faithfulness to the Lord's calling on our lives. Stay true to what HE critiques for you, and all will be well. He shall promote it to glorify Himself, and speak to those whom He wants to hear it. "The LORD gave the Word, and great was the company(God's people, not traditional publishers)of those that published it!" Thanks, Marcie! This is definitely true. I wrote about standing for what you believe in today for my homework for my World Lit class!